OAKLAND, Calif. (AP) Bob Melvin is stressing the need for the Oakland Athletics to score earlier in games, and they did just that against the Orioles. Then, the offense had to provide a boost again late when the bullpen faltered. 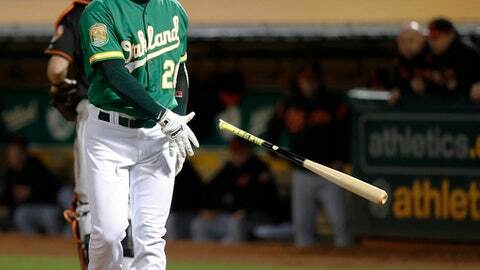 Jed Lowrie hit a tiebreaking two-out single in the sixth, Khris Davis launched a three-run homer in the first and the A’s beat Baltimore 6-4 on Friday night. After Davis connected in the first for his eighth homer, Matt Olson followed with a solo drive, but the A’s bullpen couldn’t hold a three-run lead for Daniel Mengden. Lowrie singled against Brad Brach (0-2) into the shift in right, scoring Jonathan Lucroy from third. It was Lowrie’s 10th go-ahead RBI this season. On the previous play, Orioles second baseman Jace Peterson fielded a grounder by Marcus Semien and threw out a sliding Stephen Piscotty at home with the infield in. Baltimore had tied the game at 4 in the top half of the sixth, getting RBI singles from Chris Davis, Mark Trumbo and Danny Valencia. But the Orioles lost their fourth straight game – and Adam Jones voiced his frustration afterward. Lou Trivino (2-0) induced Peterson’s inning-ending double play in the sixth for the win. Blake Treinen finished for his fourth save in six chances after Semien’s RBI single in the eighth provided insurance. Lucroy played his 1,000th career game and had three hits for the A’s, who had lost four of five. Oakland didn’t take batting practice after a late arrival home from Seattle and three straight days of pregame hitting at Safeco Field. Jones homered for Baltimore in the first to give starter Andrew Cashner his first run of support all season in seven starts. Mengden – just 1-10 in 16 career starts pitching at home in the Coliseum – struck out five over five innings, allowing three hits and one run before Yusmeiro Petit gave it up in his third appearance since his mother’s death. Center fielder Jones played in his 1,500th game for the Orioles, becoming the eighth to do so – joining company that includes Cal Ripken Jr.
Orioles: 2B Jonathan Schoop, on the disabled list since April 14 with a strained right oblique muscle, will continue his rehab assignment this weekend perhaps going from Double-A Bowie to Triple-A Norfolk given potential weather issues and a better chance to play in top conditions. ”I want him to be healthy,” Showalter said. ”The worst thing would be to rush this and he comes back and his first at-bat he goes back to square one. We’re ahead of schedule for what normally happens with an oblique muscle.” … LHP closer Zach Britton, recovering from surgery on his right Achilles tendon, threw Friday and was scheduled to do pitcher fielding practice Saturday. Athletics: RHP Paul Blackburn, on the DL since March 26 with a strained pitching forearm, threw off flat ground and is expected to pitch off a mound sometime this homestand. Melvin said it’s too soon to know whether Blackburn will be ready to be activated when eligible May 25. … LHP Ryan Buchter, dealing with a strained throwing shoulder, is not yet back to playing catch. He’s still in the strengthening phase. … RHP Liam Hendriks (strained right groin) is playing catch but is yet to throw off the mound. Orioles: RHP Kevin Gausman (2-2, 4.15 ERA) tries to win consecutive starts for the first time in 2018. Athletics: RHP Trevor Cahill (1-1, 3.00) makes his fourth start since being called up April 17, having gone 0-1 with a 4.91 ERA over his past two starts – both on the road.